Can Retirement Funds Help You Build A Respectable Retirement Corpus? Imagine you are on a holiday, basking in the sun with your spouse along the coastline of pristine turquoise never ending expanse of water. Being in the moment of tranquillity and listening to the sound of the waves on the rocks. An aspiration suddenly surfs up, to own a house at such a beautiful place or spend the post retired life holidaying often on such coasts without having to worry about anything. But the question is, how to achieve it? To own a beachfront property or to travel to beautiful places frequently is expensive. 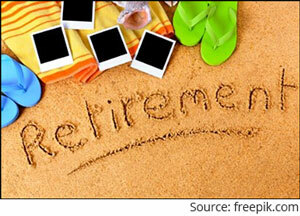 Retirement planning will ensure that your aspirations are achieved, and you enjoy a blissful rich retirement. Why is it so important to do retirement planning? Foremost, retirement - a phase where you stop working, income stops, and expenses continue. It is a phase you start living your life comfortably (the way you want) - whether it is stress-free or stressful is dependent on how well you plan for it. In my view, if you've planned well, it will definitely be stress-free, and you can have a steady flow of income till your demise. "Life is full of uncertainties. Future investment earnings and interest and inflation rates are not known to anybody. However, I can guarantee you one thing... those who put an investment program in place will have a lot more money when they come to retire than those who never get around to it." -- Noel Whittaker. But, are you following a prudent approach to retirement? Are you saving and investing enough appropriately in wealth-creating investment avenues to fulfil your aspirations? Your passion to pursue your hobbies during retirement. A number of years you have in hand to build your retirement corpus while you are working. Where should one invest for retirement? Saving and investing for your retirement is imperative and choosing the right asset class mix will help in building your adequate retirement corpus. In fact, a plethora of investment options are available and understand that each of them has a risk associated with it. So, assess the risk-return relationship before investing. It must be noted that there are various plans offered by insurance companies too like the Unit-linked insurance plans, annuity plans, etc., that are being marketed/presented as good avenues for retirement needs. But, in my view, insurance and investments should be kept separate because combining the two is detrimental to your financial freedom. And then there are government-backed schemes like pension plans, PPF, EPF, NSC along with the option to create bank Fixed deposits. Although the returns earned are fixed, these are unable to provide inflation-adjusted returns (known as real rate of returns). Besides, interest earned on bank FDs and pension plans are taxable. While PPF and EPF are great retirement saving options that offer 8% compounded annualised tax-free returns. The downside is these cannot beat inflation. Hence you can include some portion to these avenues, but do not solely rely on them to grow your retirement corpus. To invest in mutual funds, as you may know, enables you to diversify the investment portfolio to minimise risk, which is the basic principle of investing. As you might be aware, the Securities and Exchange Board of India (SEBI) has allowed mutual fund houses to offer retirement plans as solution-oriented schemes. But retirement schemes must be offered as open-ended schemes with a lock-in period of five years or until retirement, whichever is earlier. Hence not all Retirement Funds are worth your hard-earned money because if the scheme underperforms, you will be unable to switch to another worthy scheme. PersonalFN is of the view that, instead of treating retirement funds as a special category, you should consider them on par with comparable schemes such as diversified equity funds, depending on their asset allocation. Blindly investing in the so-called "best" retirement funds or pension plans will lead you nowhere, unless you have a plan in place. The sooner you begin planning and making a serious effort to secure your retirement, the greater are your chances of achieving it. It is never too late to plan. Analysing your current financial situation and creating a plan is good at any stage of your life, but preparing for retirement gets more difficult the longer you wait to start saving. Furthermore, you need to pay attention to your investment time horizon before you retire, so that liquidity is accessible when you actually need the money. Hence, investing in a diversified equity mutual funds when you are young and having an investment time horizon of more than ten years before you hang up your 'work-boots', it is preferable to take on Systematic Investment Plans (SIPs), a mode of investing in mutual funds. This way you can deal with the market volatility better and equity performs well over a longer time frame. And as you are nearing your golden years, it would be wise to shift to debt funds as your downside risk ability diminishes and you want to preserve capital. You see, there are various parameters that you need to consider while planning your retirement as they can easily influence your retirement corpus and retirement. Moreover, most of us want to have a comfortable retirement for which adequate planning is necessary. Hence, to make sure that you have enough money during your retirement, the golden years of life, start early and plan your retirement today! Procrastination will steal the benefit of compounding. Remember, the early bird gets a bigger worm. Involving your family, particularly your spouse, is vital while you plan your retirement. Together, you can have better clarity on how you want to retire; how much will you spend and how much money you need for your retirement. So, both of you can decide to reside in that beachfront property for a blissful retirement through retirement planning. Editor's note: If you want a comfortable life post retirement, don't miss out on PersonalFN's Retire Rich service. This is a new and exclusive service with the sole intent of securing your retirement. It is a DIY (Do It Yourself) retirement solution, where you can start planning for your retirement and potentially build a substantial corpus that could sustain you in the golden years of your life. It is not merely a list of funds or a particular investment idea. It is a comprehensive solution to guide you with almost ALL the necessary essentials of retirement planning. Subscribe now! Equitymaster requests your view! Post a comment on "Can Retirement Funds Help You Build A Respectable Retirement Corpus?". Click here!